Call me a cynic, but I tend to view those with as full a release schedule as Italian one-man-band Vardan very suspiciously. Having released three albums last year, and all within the same four months, it's not unreasonable to suspect that mainman Vardan is spreading himself too thin. And listening to The Woods is my Coffin, that suspicion is immediately borne out from the dull and pedestrian eight-minute opener Night of the Horned Rebirth, although things get better from then on. The following Luciferian Assault is a Darkthrone clone, but a decent one, the backing music hitting that melancholic spot well and distracting attention from the too-samey croaked vocals, but the track drags on a little too long, and the same can be said for each of the other tracks here, too. This is a shame, as it's clear that Vardan contains the roots of a good act, if that spark of black metal magic could be honed and cast into something. 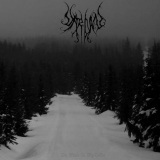 The Woods is my Coffin is much less depressive in tone and style than the previous album, moving towards a more atmospheric type of black metal, although there is still a strong DBM thread running through it, not least for the little melodic interlude in Dawn of the Followers Part I. Vardan rarely locks into that ineffable black metal spirit that makes for music that grips you by throat, but it manages it in a couple of places, suggesting all it takes is for a less hectic release schedule and more time to release a truly good album, rather than one as patchy as this.